Ready to be part of the sexiest gay tour in Puglia of the year? The sensational Culinary holiday of the year will take place this October. Two special guests will join: the sexiest chef alive, the Bear-Naked Chef, and the most famous Italian Blogger around the world, The Scruffy Italian. Both Italian, of course. Because, as Madonna says, Italians do it better! The heel of the boot of Italy, Puglia, is without a doubt one of the sunniest and most lively parts of the country, famous for its food, beaches, breathtaking landscapes… and hot men! Join Italy Gay Travels this October for an exclusive Luxury Food and Wine Gay Tour. Puglia is home to some of the best cheeses (does burrata ring a bell?) and wines in Italy. Primitivo and Negroamaro are the talk on everyone’s lips. 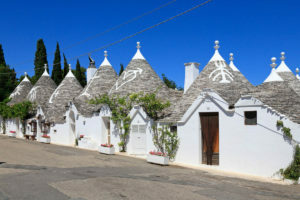 On our Gay Tour in Puglia for the Foodies you will become a connoisseur as well as getting a little tipsy too! Puglia is also one of the biggest producers of Olive Oil in the World. You will learn about the secrets of olive oil production (at the time of olive harvest) by the masters of the trade.The main ingredients in the kitchen of Puglia are Love and Passion. You will learn to cook like a local while exploring the amazing sights of this fertile land and visiting historic towns along the way. The sea-perched town of Polignano a Mare and the UNESCO World Heritage Site of Alberobello to name just a few. And if it all gets a bit much, stress not! Our on-site massage therapist is there to cater for your needs. Services include holistic, deep-tissue and sports massage. During our gay tour in Puglia, we will spend a full week in a typical Masseria (farmstead) set within acres of olive groves. The Masseria has been painstakingly renovated. It has all the charm that you’d expect from a boutique hotel: swimming pool, terrace sundowners and amazing views out into the Olive Grove! Don’t miss your opportunity to spend one full week with the Bear-Naked Chef and The Scruffy Italian in this amazing Gay Tour in Puglia at a very special price. Only 2 places left: don’t miss this once in a lifetime opportuniy! Book now this sensational offer! Still require more information about this and the other tours we are planning? Feel free to contact us if you need any information. And see you soon in sunny Puglia!